Aimee and I had a yard sale! It was great fun—hot—tiring—but fun. We were able to clean out some clutter, make a few dollars for a retreat project and share some sweet treats along the way! Aimee made white chocolate macadamia nut cookies…and I made some red velvet cake balls. Yeah, I know. I’ve made them before—but these are so good! We had them bagged up in cute bags, had some water and soft drinks on ice, and when the “shoppers” felt that they didn’t need any “stuff”, they bought sweet treats! Another idea, if you are a blogger, or have a ministry you are focusing on, as in raising money for, have some cards made up (you can do that on the computer!) and pass them out. It is a great way to witness and who knows, someone’s life may be touched, just from a silly old yard sale! BEST IDEA, make SURE you have some comfy fold up chairs for your tired rear-ends to rest in the shade! Bring an umbrella (large one) if you have no trees nearby to park thyself! LARGE pockets are necessary to hold all that money you will make—a calculator, some gum, pen for marking prices you forgot, extra price stickers (we bought colored dot stickers) and germ-x wipes. Yes. Well, that’s all the time we have today! I’ve shared some yard-sale secrets—oh, one more thing, Smile! Big! Share the love of the Lord! You never know what condition they left their house or heart in—it will bless them, and you! 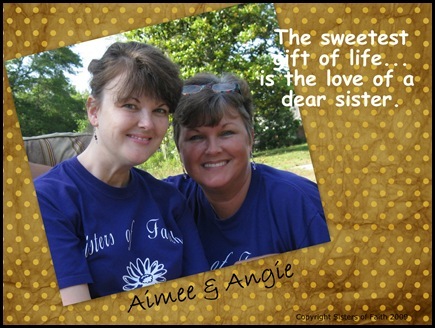 This entry was posted on Wednesday, May 20th, 2009 at 4:41 pm	and posted in For Sisters of Faith. You can follow any responses to this entry through the RSS 2.0 feed. « Are You Feeling Surrounded? Thanks for sharing the good advice! My home is in definite need of decluttering…. Awesome advice! Thank you for sharing. We had made some chili dogs with chips and soda and sold some baked goods. Those all went over better than the other items. 🙂 The apron is a great idea. We've always used an old tackle box, but it's hard to keep on eye on it sometimes. I'm having a garage sale…yes..put it all in the garage. That is how I usually do it…anything too big goes in the driveway. This year I only have four boxes of stuff so it shall all fit…garage is a nice comfy place out of the heat too. You two are just the cutest!!! So sorry that I couldn't be with you that day….I think I need a raincheck for some of those red velvet thingys!! !